Don't read this post if you don't want the Brutal Legend demo's cut-scene spoiled and don't want to read about a never-before-revealed level of Uncharted 2. Both were just shown at the Penny Arcade Expo. 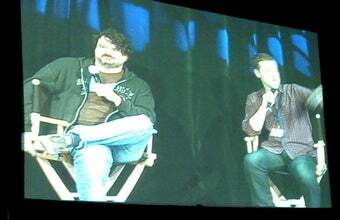 At a Friday evening panel here at PAX in Seattle called Spike Sneak Peeks, Game Trailers TV host Geoff Keighley flexed his exclusive-bearing muscles and got developers Tim Schafer and Amy Hennig to show off new parts of their major October games. Double Fine chief Tim Schafer took the main PAX stage to chat with Keighley and unveil the opening cut-scene for the demo of his team's game Brutal Legend. The clip showed the game's protagonist, Eddie Riggs, in modern day, miserably fulfilling his duties as the roadie for the band Cabbage Boy. The group's lead singer, a man who wears a Phantom of the Opera half-mask and can't stop texting, tried to flatter a brooding Riggs, complimenting the Brutal Legend hero for his roadie skills.It didn't work. After all the lead singer's band stank. The opening metal chords of Cabbage Boy's set — which perked Riggs up just a bit - were followed by the band's DJ scratching a record and the least-metal heavy metal song I've heard in some time. "I can fix everything except that," Riggs said. "Metal is dead." As with the rest of what's been shown for Brutual Legend, the voice-acting was strong and the comedic timing perfect. Schafer wanted the scene to get laughs and it did. It also did a fine job of establishing Riggs' misery in the present and his desire to get to older, more Metal times. There were some other jokes — one of them interactive — but it's seldom funny to re-write someone's punchlines. Amy Hennig, the creative director at Uncharted 2 development studio Naughty Dog, followed Schafer. She used her time on Keighley's panel to talk about wrapping up her game as it nears its mid-October release. Hennig assured the audience that the game's single-player was not being compromised by the addition of multiplayer. She also described the game's graphical upgrade from its PlayStation 3 predecessor as the equivalent of a console generational leap. The thunder of Hennig's portion of the evening was the gameplay clip she showed of a new Uncharted 2 level. She set the clip up, saying it occurred halfway through the game and realized a goal of her team's: Enabling gameplay on moving objects. Drake would start at the back of a train and try to get to someone he wants to rescue in the front. Yes, Hennig acknowledged, there have been plenty of train levels in games. But this one would not just put you on a static train that has a background zipping past you, she said. Uncharted 2's train level would feature a freight train that is fully-modeled, takes turns, has its separate cars and supports all of the climbing and shooting gameplay available to player. What she showed in the recorded gameplay clip appeared to contain the dynamism and physical reality she promised. The level was set on a verdant mountainside with a lake resting beside train tracks. A freight train rumbled through. At the start of the clip, series hero Nathan Drake climbed onto the top of the back car and machine-gunned some enemies. He tried t advance but fell through the top of a boxcar. A helicopter, as they so often do in video games, swooped in for the assault. The following sequences had Drake jumping from car to car as helicopter rockets rocked the train. Enemy soldiers filed down the train and fired, as Drake cursed them. The train cars all seemed to behave as if they had their own weight, proving Hennig's claims true. They seemed to rock as the battle rumbled them. Cars were detached or blown up. One was sent hurtling off its rails in a fiery tumble toward Drake. Camera angles kept switching as the battle proceeded in phases, but throughout the scene it looked like a player could enough control to scramble, cover or shoot. The train reached a tunnel, the battle far from done, and the clip ended. Keighley's third guest, Valve writer Chet Faliszek, talked over a live gameplay demo of part of Left 4 Dead 2's Dark Carnival campaign. The section he showed matched material I reported about from my visit to Valve earlier this week, but Keighley himself did command from the stage for me to write one bit from this part of the presentation: An audience member asked for an update on the Half-Life series. Faliszek dodged, saying the company prefers to discuss projects that are closer to being delivered. But, he teased, "The G-man is Gordon from the future and Alyx is Gordon's brother." Keighley spotted me in the front row and said I should put that "on the site." Sure, Keighely, but we all know Chet was joking. The Brutal Legend and Uncharted 2 sneak peeks, as different as they were, showed in equally convincing ways that two of October's biggest video games are coming together well. There was visual polish and precise timing to both, more good signs that these games are in good shape.